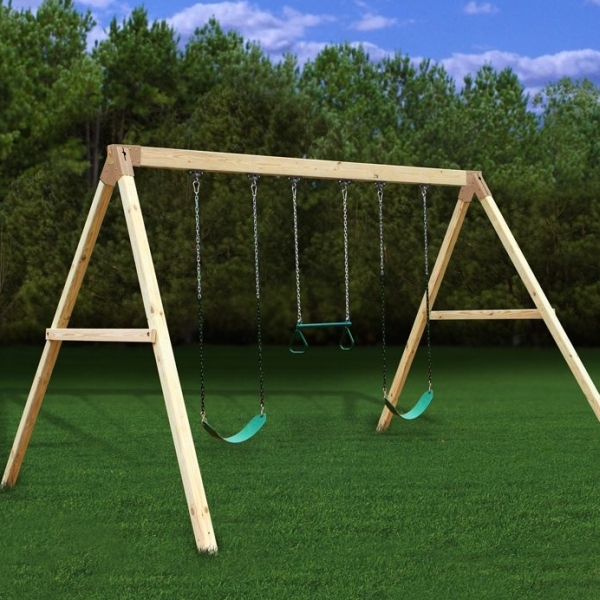 Free Standing Settler Swing Beam Kit comes with all the hardware, swing hangers and swings for 3 swing positions. East to modify for 1, 2 or 4 swing positions. 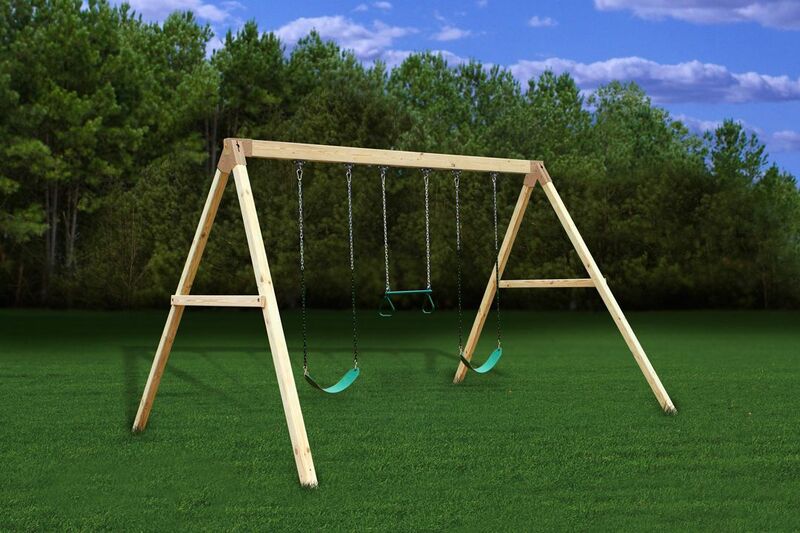 Purchase your lumber locally, assemble the kit and your children can be swinging the day away. The Settler Kit comes with complete easy to follow instructions and can be put together in one short afternoon. 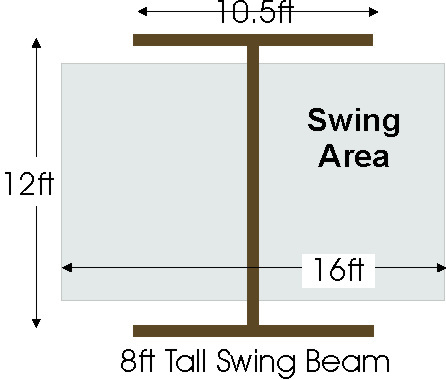 Our Free Standing Swing Beam Kit uses two 7 gauge (the smaller the gauge the better) hot hammered steel A-Frame brackets (tested up to 20,000 lbs) for two 4x4 diagonal Legs and a 4x6 beam. This greatly reduces any side to side movement. The swing beam can safely support weights up to 900lbs! 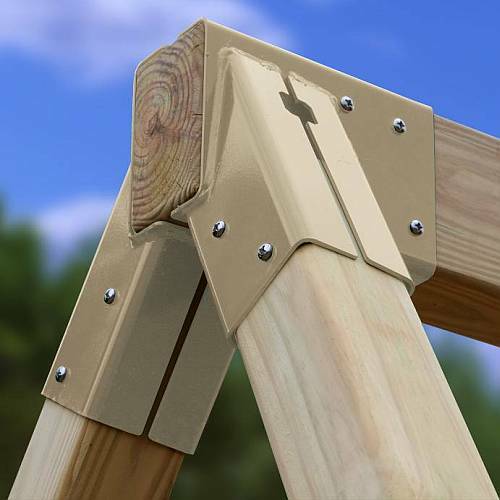 All hardware is Hot Dipped zinc galvanized to better weather the elements, works well with current treated wood chemicals, and ensures years of enjoyment. Swings use Heavy Duty Iron Ductile Swing Hangers and not the weaker single bolt per chain hangers of most other kits. 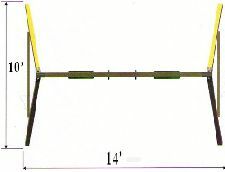 The 3 position Settler Swing Beam has a foot print of 14ft Wide x 10ft Deep x 8ft tall. You can customize your kit with choice of swings: Belt Swing, Trapeze/Rings, Bucket, Half Bucket, and more. 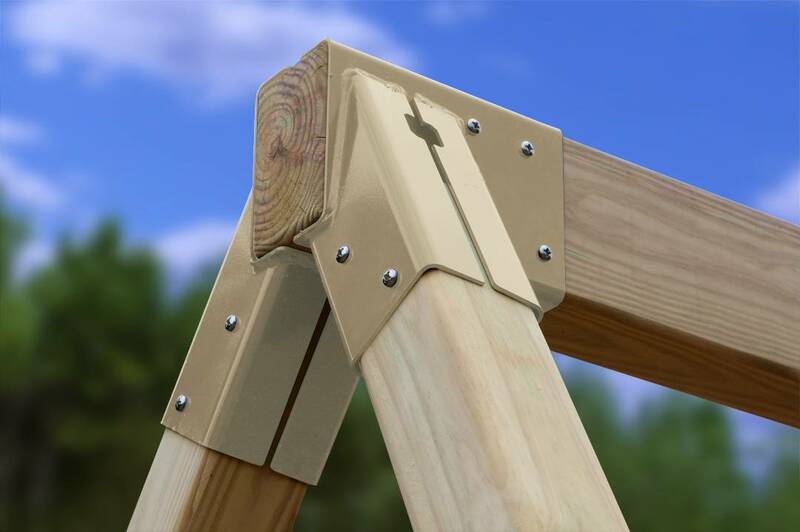 The Settler Free Standing Swing Beam Kit is the perfect Do-It-Yourself afternoon project. Can be easily modified for 1 or 2 swing positions or even a A-Framed porch bench swing. Kits include everything to build this swing set. Wood is NOT included. Estimated cost standard treated lumber is $70-$95. Use this Settler Wood List to price it locally or get specialty wood quotes. Every Nut, Screw, Bolt, Washer, & Lag included. Easy change to 1, 2, or 4 swing positions. 3D illustrated plans - Makes it EASY to build. Engineered to be FREE Standing - No anchors required. Meets and/or exceeds ASTM standards for backyard residential use. Easy afternoon DIY Project. Assembles in about one hour.